The Classic 1966 Batman Television Series Theme Park "IN COLOR" Check out the Galleries. Get your very own page that features YOU, the Batfan. Check out the Bat-Stereo-Optic-Image-Viewer. And Much Much more to come!! Adam West, Burt Ward, Yvonne Craig, Cesar Romero, Julie Newmar, Frank Gorshin and the rest of the gang are here. 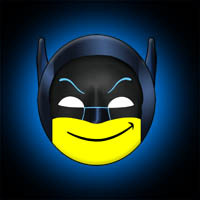 push the smiling Batfriend Logo. Special Note: You do need the FLASH plug-in to be able to experience this site. Go ahead and download it. You'll be glad you did. If you want to skip the introduction altogether, then go straight HERE.